The singer says he thought he was about to faint on live TV as he made an early exit during an interview on BBC's The One Show. The singer was coy on which role he would be taking up, going only so far as to say he would not play a stormtrooper. Gary Barlow performed an impromptu gig in a busy shopping centre. Dame Shirley Bassey and Gary Barlow OBE will perform for the Queen to celebrate her 90th birthday. Take That star Gary Barlow has caused a stir on Twitter once again after offering to play at a series of fans' 'milestone' birthdays. The Duke of Cambridge has said his mother would be 'immensely proud' of the work a charity she helped to set up does with bereaved families. Gary Barlow has given another bride a wedding day to remember after serenading her on the big day. Gary Barlow gave one fan a huge shock when he made a surprise appearance at her wedding reception. It is "not necessary" for Gary Barlow to return his OBE despite his involvement in an aggressive tax avoidance scheme, the Prime Minister has told Good Morning Britain. David Cameron said the Take That singer had "done a huge amount for the country". But the Prime Minister said the scheme that Barlow and bandmates Howard Donald and Mark Owen invested in was clearly "wrong" and said: "It's right that they are going to have to pay back the money." The Take That trio may have to pay back £26 million after Judge Colin Bishop ruled that 51 partnerships set up by Icebreaker Management were used for tax avoidance purposes. 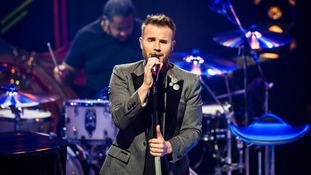 Gary Barlow has spoken about how his heartbreak over the stillbirth of his daughter and the death of his father influenced his latest album. In a new BBC documentary, When Corden Met Barlow, the 43-year-old singer speaks for the first time about the loss of his daughter Poppy in August 2012, three years after his father Colin died. He suggests to interviewer James Corden that he is channelling the people he has lost and is using "someone else's" voice. Barlow said: "From that thing happening, to my dad's passing, there's a lot of them in this record with me. "I wanted it to be a celebratory record because that's where we're at in our lives with the whole thing that happened. And it makes me really happy when I see people going crazy to that song." He added: "It keeps a life and a flame in the whole thing. The film to be screened on BBC1 on Monday at 9pm.